Vasquez’ strength’s mainly revolves around his passing ability. If this was the sole area we were looking at, then it wouldn’t be incorrect to call his season an outstanding success. Vasquez led the league in total assists with 704–26 more than his nearest competition. Vasquez also finished 3rd in assists per game with an even 9. It’s mainly those numbers, along with his 13.9 points per game (5 more than last season) which carried Vasquez to second in the Most Improved Voting. And before we get negative in a bit, I want to break down just how well Vasquez passed this season. While he was on the floor, Vasquez assisted on nearly 45% of the team’s made field goals. Or, in the 68% of the team’s total minutes Vasquez played, he had a hand in nearly 50% of the scoring. Or in words Ron Burgundy would understand, 30% of the time, Vasquez helps the team score every time. And that’s not counting the baskets he makes himself. No two ways about it, Vasquez was a huge part of the Hornets offense. Now what did those assists do? Going by the, slightly incomplete data on hoopdata.com, most of his assists go to players scoring at the rim (3.9 per game) and for 3-pointers (2.2 per game). As I’m sure we’ve said to death on the site, those are the most efficient locations to shoot from. So not only is Vasquez helping the team score, he’s getting them high quality looks. Vasquez ranks in the top ten of both those areas. Not to take anything away from Vasquez, but it certainly helps to play with Anthony Davis and Ryan Anderson. In terms of his own shot attempts, Vasquez looks to shoot mainly in close and from 3-point range. Vasquez is able to get his shot off in close due to the usual size advantage he has along with a very effective floater he unleashes often when driving through the lane. Vasquez improved his shooting from 3-point range this season, hitting 34.2% of his looks from deep compared to 31.9% a year ago. This improvement, along with his size, has allowed Monty Williams to use Vasquez off the ball more than last season. Rather than solely needing the ball to be effective, Vasquez can help spread the floor and often play the SF position when Monty decides to run a three guard lineup. As I said before, Vasquez has a tremendous ability to pass the rock. As we breakdown his season some more, it’ll be up to you to decide if it counterbalances the rest. I’m going to need to break this section down into parts. One has to wonder if part of Vasquez’ numbers come from an offense that is very point-guard-centric. Brian Roberts stepped in a put up some good numbers (remember the Nuggets game?) and, depending on how you view it, could be a knock down on Vasquez’ season. Another startling statistic is that the Hornets had assists on 59% of their field goals with Vasquez on the court. When he sat the team had assists on 56% of their makes. It’s a difference of 3%. For a player with an assist percentage of 45 and all sorts of good looking stats, you’d expect that difference to be much higher. It raises an eyebrow. On the season Vasquez had a TS of 50.2% and an eFG of 47.4%. Both are below average for guards in the NBA. Overall his 13.9 points per game look good but it took him 13 attempts per game to get there. Not very efficient. The Hornets’ record reflected this with the team going 7-13 when Vasquez attempted 16 or more shots. Change the number to 14 or more shots and the record drops to 11-25. Compare that to a record of 5-7 when he attempts his average of 13 shots per game. However the sweet spot seems to be between 9 and 10 attempts per game. The Hornets went 7-5 in those games. For the season, Vasquez finished with an offensive rating of 105 which ranks him 138th best in the league. You could certainly do worse, but Vasquez is not a primary scorer or even a second option–he’s a third option at best. According to mysynergysports.com, Vasquez 0.82 points per play which ranks him 347th in the league. Overall, any of his offensive statistics besides assists stinks. Vasquez finished the season with a very good assist to turnover ratio of 3.48 which ranked him 16th in the league. But he also set the Hornets team record for turnovers in a season and ranked 7th worst in the NBA with 247. Basketball-reference.com says he turns the ball over 18.6 possessions per 100 plays. NBA.com ranks him 307th best at keeping the ball which is not exactly a compliment. The turnovers are what make Vasquez feel like a boom or bust type of player. For every awesome pass he makes, it feels like he commits a turnover soon after. Inconsistency is something that really hurt the Hornets this past season and Vasquez’ money or nothing play style added to that. Vasquez is limited by his athleticism. While he often has the height advantage, he lacks to the speed to stick with quick point guards defensively. While the Hornets defense as a whole was incredibly disappointing this year, Vasquez struggled to rotate defensively and often was swallowed up by screens when opponents ran the pick and roll. As a team the Hornets were worse defensively with Vasquez on the court allowing 112.7 points per 100 possession compared to 108.6 with him on the bench. Overall, according to Synergy Sports, Vasquez gave up 0.89 ppp which ranks 258th in the league. In isolation he was even worse, allowing 0.93 ppp. Against pick and roll ball handlers he fared slightly better at 0.85, but still ranked 172th. Vasquez struggles to disrupt opposing offenses which is evident with his average of less than 1 steal per game. Opposing teams also shoot better with him on the floor with their eFG% increasing 2%. Like the rest of the team it was a year to forget defensively for Vasquez. No one is going to look outstanding after the recently completed 27-55 campaign the Hornets (Pelicans) endured. Despite his strong assist numbers, it’s hard to consider Vasquez’ season a huge success. Overall, he just had to shoulder too much off the offensive load. Creator, distributor and scorer. With injuries and the level of talent on the roster Vasquez was simply asked to do too much compared to his ability and skill. There were nice moments, the assist numbers look great, and they earned Vasquez second place in the Most Improved Player award, but are overshadowed by all the other areas he hurt the team: the poor defense, inefficient shooting. 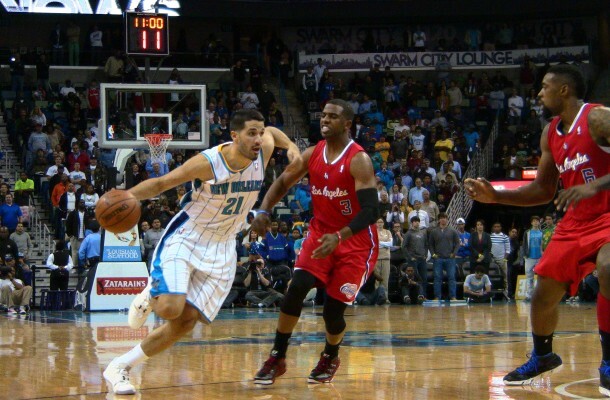 In the beginning of the season the Hornets announced they had picked up their team option on Vasquez for next season. Barring a big free agent signing or trade, expected him to remain the New Orleans Pelicans starter next year. Expect further improvement in his shooting and the assists to remain strong. Knowing how Dell Demps likes to operate there Pelicans will surely gauge the trade interest in Vasquez around the league. It’s not that Vasquez isn’t a good player but we’ve likely seen the ceiling of his ability. Vasquez would be a tremendous backup point guard and spot starter but it’ll be a stretch for him to improve enough to become a top 20 point guard. Check out the entire Season in Review series here at Hornets247.com. Love Greivis as a player and a competitor to death but he’d be a much better fit as a 6th-7th man on a contending team than a stop-gap overachieving starting PG on a rebuilding team and his value on the trade market may never be as high as it is now. Hurts me to say this, but Dealer Dell has to let him go this summer! I also like the idea, floated by Dell or Monty late in the season, of Vasquez playing SF. Imaging we sign for nothing a nice PG, say a $5M/season guy, and slide Vasquez to starting SF. Now you add a perimeter shooter to go with Lopez and Davis down low, and you move a rebounder, Aminu, to the 2nd team with three scorers (Roberts, Anderson, and Smith) and Rivers. Then you draft BPA (best player available) and maybe add more pieces when your cap space creates the opportunity in the future. That should be a team in the middle of the NBA standings and fighting for a playoff spot next year. I like the idea of GV playing reserve minutes at the 3, he’s the best rebounder of all the guards and is above avg. from the corner 3. But, him playing starter’s minutes as a SF makes me worry to much about the defensive ramifications. I been saying, as bucklez stated above, greivis is a great multipostional 6th or 7th man, 1 2 or 3, bringing fire and scoring off the bench (comparable to a young Manu). Credit is due to him for willing to serve as the placeholder at the one this year although everyone knows starting one is not where his nba future lies. My dear friend THERE IS NO SHUT DOWN GURDS IN THE NBA AS THERE ARE SHUT DOWN CORNERS IN FOOTBALL …the top guards in this league will get their points night in and night out, that is why they get the zillion dollars, so the theory that I hear all the time on the importance of a quick guard for defense (one on one on a guard) is bogus, watch the playoffs and please tell me what guards are stopped from getting their points. Let me answer that, NOBODY. You play defense on guard by getting help once they drive , in New Orleans they had terrible help, watch the Spurs or even the Heat play and see what I’m talking about. look Vasquez can drive to the bucket and he can serve the rock and he is a good shooter..he is a good point guard and most definitely a top 15 guard in the NBA..
Vasquez will be a playoff point guard I personally hope is not as a Pelican because those fans for some reason just don’t like the guy no matter what he does….